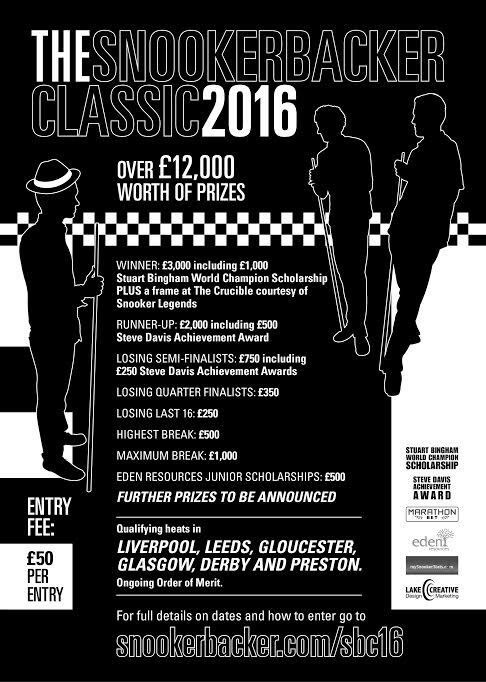 This season’s Snookerbacker Classic is now open for entries. Full details are contained below. Winner: £3000 including £1000 Stuart Bingham World Champion Scholarship PLUS A frame at the Crucible courtesy of Snooker Legends. 20th February & 21st February: The South West Snooker Academy, Gloucester (2 x 32 players, 2 x 2 qualifiers) QUALIFIERS – LEO FERNANDEZ, SAM CRAIGIE, RYAN CAUSTON AND JAMES BROWN. 26th March & 27th March: The South West Snooker Academy, Gloucester (2 x 32 players, 4 qualifiers) QUALIFIERS – JAMIE CLARKE, CHARLIE WALTERS, KISHAN HIRANI AND JAMIE BODLE. All matches are the Best of 7 frames. Each winner from the 16 player qualifying heats progresses to the Grand Finals. The two finalists from each day of the SWSA 32 player heats progress to the Grand Finals. The player at the top of the Order of Merit List who has not already qualified will also progress to the Grand Finals. Click here to view the full terms and conditions, by entering you are agreeing to these.